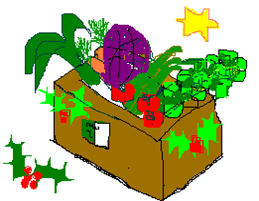 The Christmas boxes on Bucky look like this. Cartoon icons. * Pause any current /regular orders you may have from the Christmas week (23rd, 24th, 25th) till further notice. You can log in and un-pause this in January when we restart the boxes. * ‘When would you like it?’ Please choose the date of the Christmas week offered by Bucky — ie the 23rd, 24th, 25th December. We will of course deliver it on either the 22nd or 23rd depending on your normal delivery round. *​IMPORTANT!! Remember to click the ‘complete order’ button at the bottom of the page.